According to a recent study, women who suffer with migraines have a significantly reduced risk of developing type 2 diabetes. The study also discovered that, in the years before a diabetes diagnosis, the frequency of migraines decreased. Migraines and type 2 diabetes are both common conditions. In the UK, around 8.5 million people are thought to suffer from migraines (the exact number is unknown as not everyone who has migraines goes to the GP about them, and some sufferers remain undiagnosed). For type 2 diabetes, the number of sufferers is over 3.3 million. However, the risk of developing type 2 diabetes is decreased by 30% for women with active migraine, compared to women who have no history of migraine. 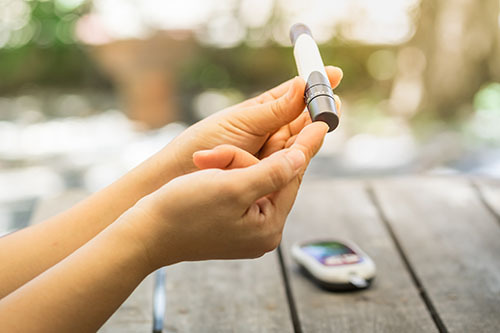 This decreased likelihood of type 2 diabetes was identified thanks to an observational investigation which analysed data from the surveys of more than 74,000 women who were living in France and were members of a health insurance scheme and in the E3N Prospective Cohort Study. The women had filled out health and lifestyle questionnaires every few years between 1990 and 2014, and the information for this latest migraine and diabetes study was taken from there. The reason why migraines and type 2 diabetes has an inverse association is as yet unknown, but there are some theories. One theory is that there could be something about diabetes that suppresses or reduces migraines. Another is that the factors which reduce the risk of diabetes increases the risk of migraine. The study authors also suggest that one mechanism which could be a factor in the inverse link between the two conditions is CGRP (calcitonin gene-related peptide). This is because CGRP often plays a role in migraine attacks, but it is also used in metabolising glucose. More research will need to be done to understand why those with migraines have a lower risk of type 2 diabetes, and whether this discovery can in some way help to develop new and better treatments for migraines. This was posted in General news and tagged Diabetes, migraine. Bookmark the permalink. ← What Kind of Headache Do You Have?